We have been very busy lately with special events, but those are now mostly over (with one very large project remaining) and shop work was returning to normal. Pete Galayda had this bell from the CCW 300 completely refurbished and sitting on the shop bench when we came in. Of course, everyone just HAD to ring it. Gerry Dettloff and John Faulhaber helped hoist this heavy item up on the hood and then bolted it in. While it looks like Gerry is about to scuff his scalp on the roof rafters, it is just the photo angle and perspective. But this is a RARE shot of Gerry without a hat! We had a skeleton crew today but that did not stop Lorne Tweed from continuing to make progress on the project. 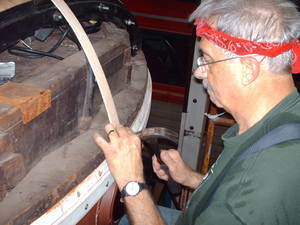 Lorne is painting the interior of the sides in the standee window areas. I think all of the remaining ones are now painted and ready to have the rubber gasket and glass installed. That will make a big impact on the appearance of the car from the outside. 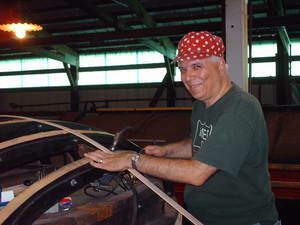 Lorne Tweed is working on the standee window areas inside CTS 4223, our Cleveland PCC car. 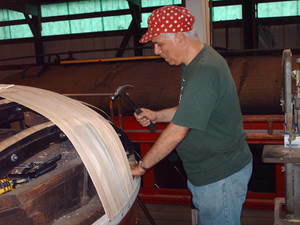 Here he is painting the first coat of the interior cream enamel. This is required to be done before the window itself is installed and put in place. These oval windows are so named so that riders who are forced to stand in a crowded car can see out. Simon Harrison is continuing to clean and prep the front sign box for painting. Tight quarters, but we are cleaning and removing decades of old flaky paint and dirt. By days end Simon was applying new bright white primer to the inside of the sign box. The purpose here is similar, that the frame and inside areas are to be painted before mounting the new glass for the sign box. From the outside looking in, you can see that Simon is enjoying his day of volunteering. Do you want to be on the outside looking in, or can you join the friendly team of volunteers, and be an insider? After cutting 300+ roof slats during the previous weekends, the time had come to begin the installation of the roof slats onto the roof ends of the car. The rear of the car was chosen because of good lighting and the lack any special cutting unlike the front which has the roof mounted headlight. Jeff Brady and Ray Schmid worked in the morning to prepare the carlines for the installation. Fans used in the morning to move the hot, humid Car Barn air were not needed later in the day as rainy weather arrived in the early afternoon and brought cooler temperatures that made the working conditions better. Work will continue during September to complete the ends with two layers of roof slats. Pictured below: Ray Schmid and Jeff Brady, nailing the first slat. Pictured below: Ray finishes the day by nailing the 10th roof slat.